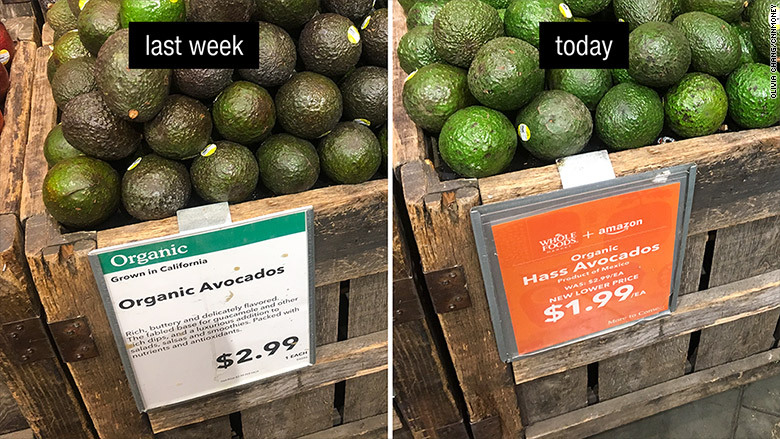 Whole Foods is a whole lot cheaper. 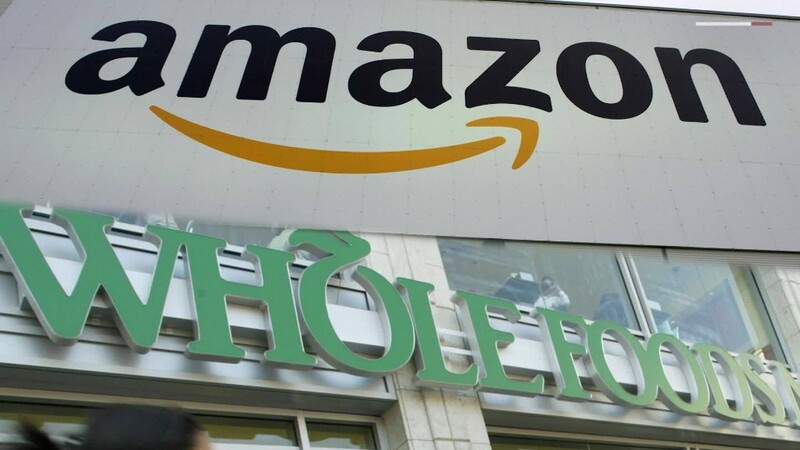 After completing its $13.7 billion purchase of Whole Foods on Monday, Amazon slashed the prices of dozens of items at all 460 of its new grocery stores. From fresh fish to produce, prices were down across the board. CNNMoney checked out its bustling location at Columbus Circle in New York. 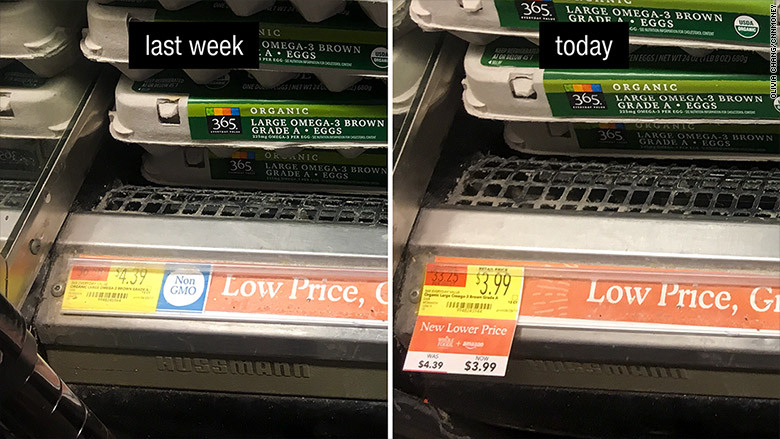 New signage promoted the deal and the lower prices. 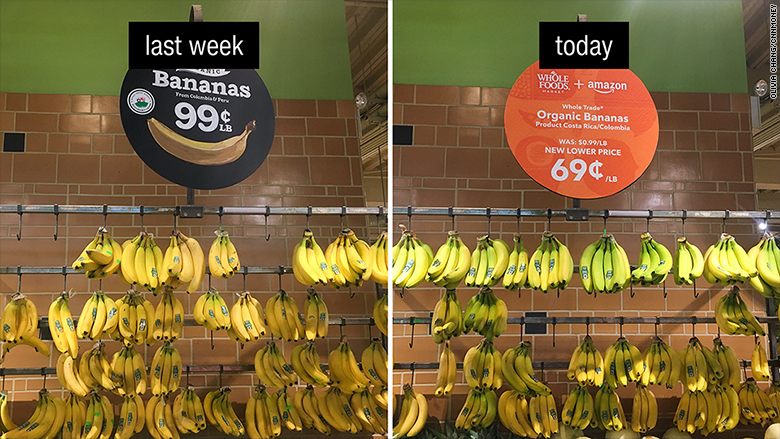 "We're growing something good," said a large sign at the entrance with Amazon (AMZN) and Whole Foods logos. 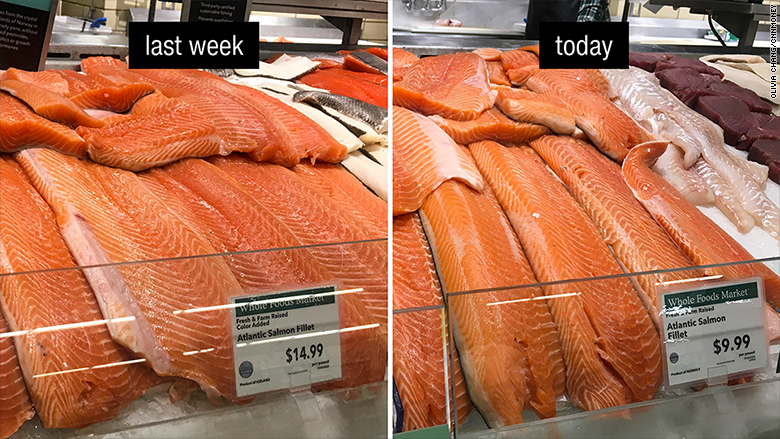 Fresh Atlantic Salmon is $5 cheaper, now selling for $9.99 per pound. 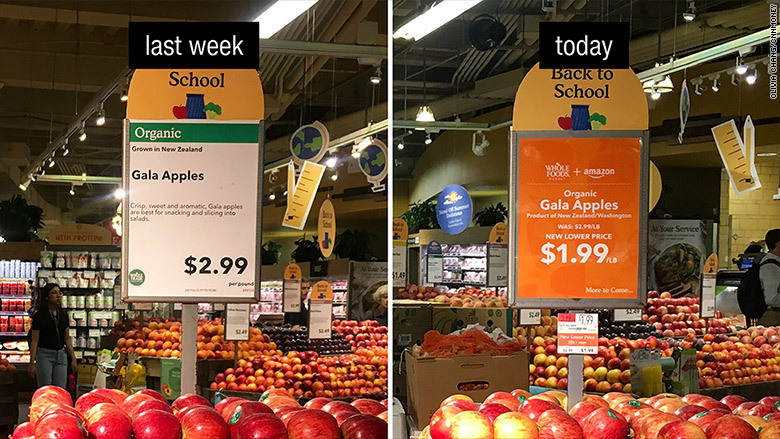 Apples were also cheaper, with Gala now being sold for $1.99 (reduced from $2.99) and Fuji apples also being reduced to $1.99 a pound, down from $3.49. 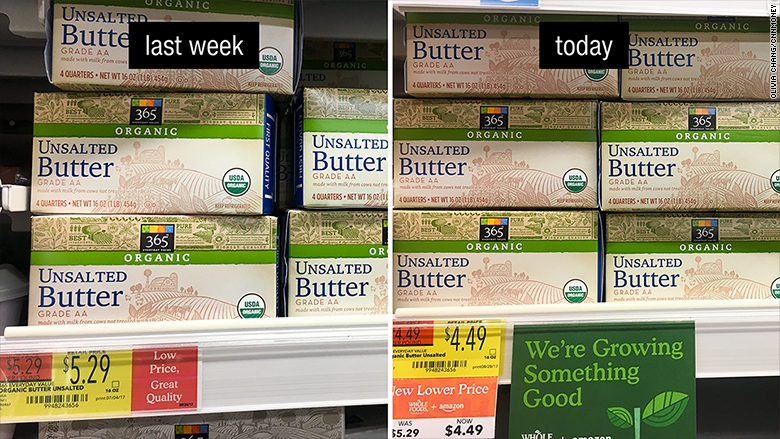 Whole Foods also chopped a dollar off its in-house brand of creamy and crunchy almond butter to $6.99 a jar. Rotisserie chickens are a dollar cheaper, now selling for $7.99 each. Yet, perhaps the biggest sign that Amazon has moved in: Whole Foods is now selling gadgets. 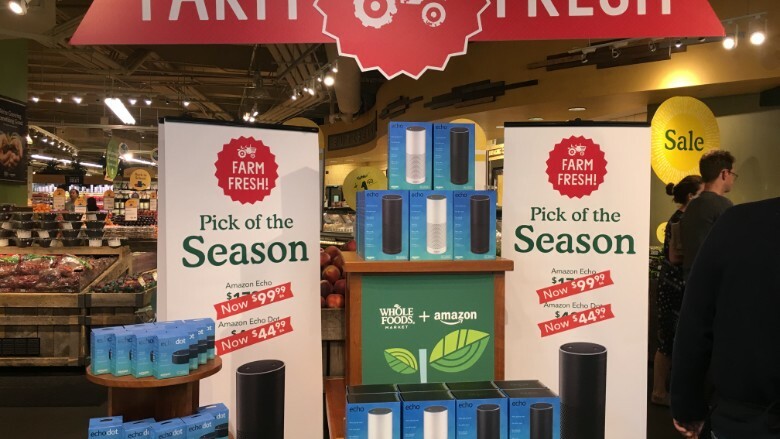 There was a huge display of "farm fresh" Amazon Echo devices that were being sold for a slight discount. 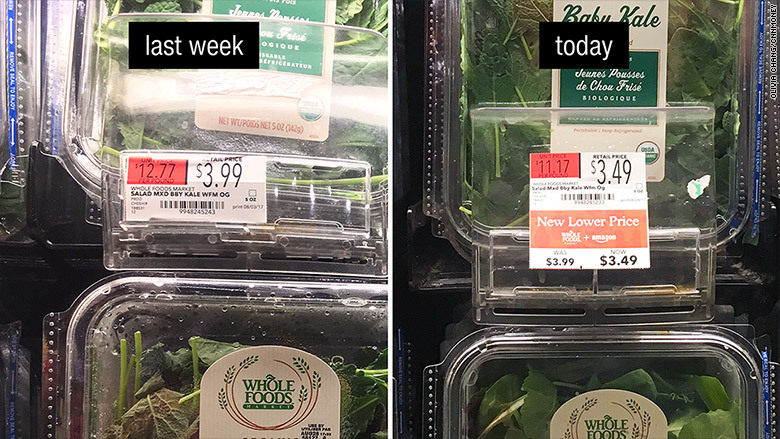 CNNMoney took photos to show the difference in prices.